If I haven’t mentioned it before, I say it now: I am thankful for the Internet. 19 years ago, the husband and I met thru mIRC. We might never have met without the Internet. I say this because we had no common friends or interests, and we moved in entirely different worlds prior to knowing each other. Today, I am showing appreciation for something more specific that requires access to the Internet: Apps that I use all the time. Entertainment. Information. Inspiration. Communication. Creativity. Keeping in touch with loved ones no matter how near or far. Convenience. Feeding your inner shopaholic. These are just some of the things that these apps represent. Yes, there is so much to be said about social media and it can be a real trap. We spend so much time scrolling through our feeds and many times it breeds negativity. We grow jealous of other people’s seemingly perfect lives, their always clean homes and workspaces, their travels, and even their OOTDs and food shots. How can they look perfect all the freaking time?! If that’s how you’re using social media and it affects you by making you feel like you aren’t enough – then I would be the first one to tell you to walk away from all of it. I try to be conscious about NOT hiding behind the screen while in other people’s company and I do call out the husband whenever he’s on his phone too much while we’re supposed to be out enjoying a meal together, or hanging out. More importantly, I firmly believe in using the Internet as a platform for spreading good, and for enriching ourselves and our relationships. It’s just like everything else in life, we are given tools that are neither good nor bad in or of themselves, it’s up to us how to use them, and to what purpose. How about you? What apps are you thankful for and why? Just as we did back in July, we went all the way to Central Square at the Bonifacio Global City last week for The Good Trade fair. It’s a weekend pop-up of small businesses espousing a zero-waste and sustainable lifestyle. I finally restocked on the first organic deodorant I’ve used that didn’t have me worrying about smelly pits after a long day – Zero Basics Deodorant is all natural, keeps you dry and smell-free for 24 hours (maybe more), and doesn’t leave chemical residue that darkens your pits. Believe me, I have tried deodorants from a couple other local organic brands and this is the best so far. One bottle will go a long way, unfortunately for me, I dropped my first bottle which is why I needed to restock so soon. Sa totoo lang, ikinalungkot ko yun. The bottle was still more than half full, and I just really had such a good product experience. My deo of choice used to be Dove Original. I love its powdery smell. I was quite happy with it except that the container ends up in a landfill and will probably exist longer than I will. So I made the switch. This one comes in an amber glass bottle with a spray nozzle and is refillable at a discount. Zero-waste, and cost-effective. I also got a pair of bamboo toothbrushes from the Zero Waste Hub, and filled a bottle that I brought with me with peppermint hand soap from Ritual.Ph. I love that there were a number of brands there that allowed for package-free, buy-what-you-need purchases. It does feel a little weird to already be lugging a shopping bag of empty containers BEFORE you do any actual shopping, but it really wasn’t all that bad, and not an inconvenience. It was also great to see Anthill Fabric weaves up close and personal. I didn’t buy any this time because sizes do tend to be for the average Pinay (translation: maliit para sa’kin), and they do cost considerably more than fast-fashion options. I have my eye on a couple of pieces that I might save up for a custom order though. It was also great to dialogue with some of the shop owners and learn a little bit more of their products and advocacies. I was really trying to be intentional with my shopping and didn’t want to just purchase whatever I fancied – but there are definitely new-to-me brands that are now on my radar ? What these fairs do, really, is make us more aware of the small changes we can do that can have great impact in reducing plastic waste, and leading a sustainable lifestyle that will be friendlier to Mother Earth. I was really looking for an alternative to dishwashing sponges. We go through one of those every couple of weeks and I know there’s a better alternative out there. I was hoping to find wood brushes or those abaca scrubs that weekend. Sadly, whatever stocks were available had already been sold out. I didn’t buy any. But the lady who makes them was nice enough to talk to me about her products. I mentioned that I’m a yarn hoarder and could probably make one for myself. She recommended using cotton thread and even told me about how to keep these scrubbies clean and sanitized so they can be used for a long time. SO I made a couple of squares to try. I actually still have a few sponges for backup but so far, the scrubbies are holding up and doing the job just fine. We have a silicone pot scrubber that we got from Taiwan for the tougher stains so I’m hoping that this is a switch we can do without any hassles. I just have to convincethe hubby to use the scrubbies instead of the sponge. I made a couple more to give to a friend to test-drive too. Friends and family out there who would love to switch too, I can make a couple for you as Christmas presents, just let me know! Ratings and feedback on products and sellers influence my shopping behavior, so when I find companies or online sellers that make me a happy customer, I try to spread to word. I just love how you can get fresh, organically grown fruits and vegetables delivered to your door! The price and quality is way better compared to what you’d find in the big grocery chains. This is already my second order. I was so happy with the first batch of mixed greens that I just had to go and order more before I ran out. The greens stayed fresh longer, and also tasted so good. Carrots came with our first order, and I grabbed one pack of their free tomatoes. We got avocado too. They are not yet ripe upon delivery but they include a tip sheet so you don’t accidentally cut through the fruit before it’s ready (but I still did, Ha! Excited much?). On this second order we’re also trying their Sweet mangoes (still waiting for those to ripen), and Indian mangoes (sarap!). Although there’s a bit of plastic packaging included, I think they are trying to minimize that as best they could and that is truly appreciated. For my next order I’ll have to remember to tell them to go paperless – I have no use for the printed invoice, and though I appreciate the tip sheet and their message to customers, I can just view those online. They have a shopping cart system on their website. They’ve got good pictures, FAQs, and detailed description for each product. Delivery date (tentative) is clearly displayed on the site, and they also send you an SMS to confirm. I received my text confirmation a day before scheduled delivery, and they ask you to respond. Since I know I’m talking to a live person, I also let them know my time preference. If you would like to place an order, be sure to check their FAQs. Cash on Delivery. As mentioned above, you already know the tentative delivery date even before you order so it’s very easy to plan to have someone available to receive the produce, and pay. Sweet! They offer free shipping for orders above PHP 450 otherwise, shipping costs PHP 75. They don’t deliver everywhere, but have a specific delivery coverage which covers most of Metro Manila. I understand this is to ensure the quality and freshness of their products. Let me be clear, this is not a sponsored post. I have not received any compensation in exchange for this – I am just a happy customer spreading the word. My inner shopaholic has been temporary satiated: I received two deliveries – a bag and a new pair of shoes! It just so happens that this shopper digs both brick and mortar shops as much as their online counterparts. In fact, I’m somehow even more partial to the online shops because I admire the entrepreneurs behind them. And when they sell locally made products, I’m hooked even more. So I’ve decided to feature reliable shops I’ve bought from, starting with today’s post. My dream bag is not an LV or a Birkin. I’d love to have them too, but I tend to lean on the more realistic dream so I’m betting on the Tod’s D Styling Bag. I wanted one so badly that we went to Greenbelt after shift one day to check out the store. I’m a true blue QC girl and am totally unfamiliar with Greenbelt and the interconnected malls in Makati. Research told me which Greenbelt the Tod’s store was located in, but not where to park so you’d be close enough. We drove, we parked, and we ended up having to walk, and walk, and walk, all the way to the right place, and back again after. It was tiring! Was it worth it? Not really. I ended up really disappointed. The store was there yes, a nice small D Styling bag was actually available. But when I asked the sales person about the price – it took a few seconds for me to respond as I mustered all the grace I had to say, with my OM face, Oh, I see. Thanks. Do you have it in blue? Alfred didn’t hear her, he was busy looking at other styles he thought I might like. So he was surprised when I tugged at him and indicated it was time to leave, with us just being at the store under 10 minutes. He only understood when I told him how much a bag was. Haha! Now, I finally have beautiful deep blue bag. I ordered a plain blue Chloe bag from La Bolsa (@michellego on Instagram) on Tuesday, and it was delivered to my doorstep the very next day. Apart from ordering over the phone, I also didn’t have to go anywhere to make a payment. They agree to COD (cash on delivery) for Metro Manila orders. Cool! This bag costs Php 1000 in total, inclusive of Php 100 shipping fee. It measures 15×9, roomy enough for all the stuff I tote around daily, including my Mason jar I have yet to use it, but am already excited to. La Bolsa bags are proudly Philippine made. Follow them on Instagram @michellego and order yours today! 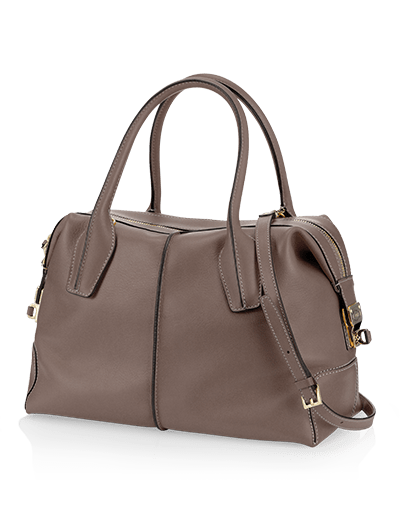 As for the Tod’s D bag, Someday. Do you have a dream bag? I know not everyone understands what bag lust is, just like not everyone could justify getting an electric guitar, or more than one pair of original Jordan kicks. So if not a dream bag, do you have any other dream item out there?